What do sales professionals want to accomplish on prospecting calls? • To reach the prospect directly. • To “qualify” that prospect (usually by asking a lot of questions). • Assuming they get “good answers” to set up an appointment or some other appropriate next step. What do prospects want to know when you call them? You’ll note that these two agendas are in direct opposition to each other. 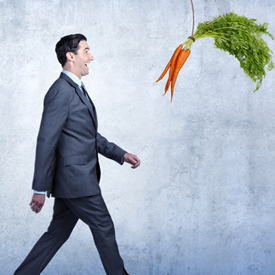 Unfortunately, many sales professionals are creating objections by following their own agenda rather than their prospect’s agenda. Many sales professionals tell me they believe they are being respectful of a prospect’s time by asking, “May I take a moment of your time…” and that this question also serves to help in that all important qualification process. The above script, however, does not answer the prospect’s two top questions: 1.) “Who are you?” and 2.) “What do you want?” When a prospect doesn’t have the answers to those two important questions, they frequently will not engage. Prospectors end up in a struggle before they’ve even really started. Do your homework. Pre-qualify your list and make sure that you are only calling prospects that fit your well defined parameters. Create a solid introduction based on how you (your company, product or service) helps customers. When you get your prospect on the phone, get to the point. Saying what you have to say clearly and succinctly actually is more respectful of your prospect’s time then floundering around trying to convince a skeptical prospect to answer your questions. When you follow your prospect’s agenda rather than your own, you will be astonished to discover how easy it can be to engage with prospects. 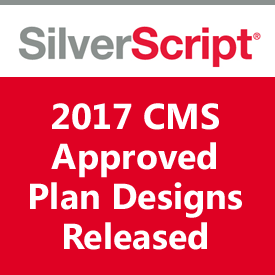 SilverScript has released their 2017 CMS Approved Plan Designs. Did you know that SilverScript® has more members in a Part D plan than any other Part D plan sponsor? CMS reports that SilverScript has more than 5.5 million members and more than four million of these members are actively enrolled in our SilverScript Choice PDP. We are confident that SilverScript will be well received by Medicare beneficiaries and agents during the 2017 AEP, too. CMS just approved their 2017 PDP premiums, and plan designs are approved and finalized. We encourage you to have this product in your portfolio for the upcoming enrollment window. The SilverScript Product and Process course is now available via the SilverScript Agent Portal’s Training & Certification page. Now is a great time to complete all of your annual certification requirements. Remember, you must complete the 2017 annual certification requirements before you can market SilverScript plans this AEP and you must complete the requirements prior to December 7, 2016 (the last day of AEP), in order to be eligible for 2017 renewal commission. SilverScript now has a direct relationship with the AHIP training website. Agents who have completed 2017 initial training and/or annual re-training certifications through AHIP can have their results automatically submitted to SilverScript. Instructions are on the SilverScript Agent Portal’s Training & Certification page. 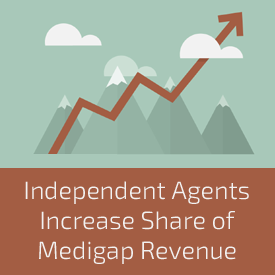 More issuers of Medicare supplement insurance policies are selling the products directly to consumers, but independent agents are generating a higher percentage of the Medigap sales revenue. Analysts at Gen Re have put data supporting that conclusion in a summary of results from Gen Re's 2015 Medigap issuer survey. A Medigap insurance policy helps people who have the traditional Medicare Part A hospitalization insurance and the traditional Medicare Part B physician and outpatient services coverage fill in the many traditional Medicare coverage gaps. A Medigap plan can help the enrollee meet Medicare deductibles and pay Medicare co-payment and coinsurance bills. Gen Re, a Stamford, Connecticut-based reinsurance arm of Warren Buffett's Berkshire Hathaway Company, received 51 completed questionnaires for its 2015 Medigap issuer survey. That was down from 54 in 2014, but it was up from 50 in 2013. More Medigap issuers reported they are selling the products straight to consumers, without help from agents. The percentage of issuers saying they used the direct-to-consumer channel rose to 55 percent in 2015. That was up from 51 percent in 2014, and up from 41 percent in 2013. But 87 percent of the active issuers said they sold Medigap coverage through independent agents last year. The share of sales revenue coming from independent agents rose to 67 percent in 2015. Independent agents accounted for 65 percent of the issuers' sales in 2014, and 59 percent in 2013. In 2015, 40 of the Medigap issuers that participated in the Gen Re survey were actively selling new Medigap policies. Revenue from new sales rose 4.2 percent, to $2.2 billion. The number of people covered by the new policies sold rose 3.2 percent. Revenue from all Medigap policies in force rose 5.7 percent, to $19 billion. The number of people covered by the policies rose 8.5 percent. Congress created a standardized "letter plan" system for Medigap in 1992. Each new plan sold must offer the standard package of benefits associated with one of the letter plan categories, such as the popular Plan F category. But the country relies mainly on state insurance regulators to oversee the Medigap market. The Centers for Medicare & Medicaid Services has much less direct involvement with overseeing Medigap plans than with overseeing Medicare Advantage plans or the Affordable Care Act public exchange plan system. Because CMS gets less information about the Medigap program, it tends to publish less data on that program than on other big public health programs.